Francesco Gasparini: (b Camaiore, nr Lucca, 19 March 1661; d Rome, 22 March 1727). Composer and teacher. In 1682 he was active as organist at Madonna dei Monti in Rome, where he probably studied with Corelli and Pasquini. He was admitted to the Accademia Filarmonica, Bologna, as a singer on 27 June 1684, and as a composer on 17 May 1685. According to Hawkins, he and his brother (3) Michelangelo Gasparini were living as pupils in Legrenzi’s house in Venice in 1686, but in 1687 Francesco was taking part in accademie in the Roman palace of Cardinal Benedetto Pamphili, both as a violinist and as a composer of arias and cantatas to texts by Pamphili himself. In 1689 he became a member of the Congregazione di S Cecilia and also played in a revival for Pamphili of Lulier’s S Beatrice d’Este. At this time he probably also met Alessandro Scarlatti, and the two were later to demonstrate a mutual respect: Scarlatti sent his son Domenico to Venice in 1705, where he had lessons from Gasparini, and the two exchanged cantatas in 1712. Gasparini’s first known operas were Roderico and Olimpia vendicata, both produced in 1686 at Livorno. In 1695 he published a set of cantatas. He must by this time have achieved some reputation, as on 5 June 1701 he was appointed to the important post of maestro di coro at the Ospedale della Pietà, Venice, in which city he met Vivaldi, Legrenzi, Pollarolo and Lotti. Gasparini was very successful in this post, which involved directing all the conservatory’s musical activities. He expanded the staff (he engaged Vivaldi as violin master) and by 1707 the conservatory ranked as one of the best in Italy. With the move to Venice, Gasparini’s career as an opera composer also began in earnest; often he wrote three or four new works in a year, most of them first performed in Venice. On 23 April 1713 Gasparini was given six months’ leave from the Pietà. He never returned but settled again in Rome (operas produced at Florence in Carnival and autumn 1715 may indicate an extended stay there). In July 1716 he succeeded Caldara as maestro di cappella to Prince Ruspoli, for whom he worked until 1718, living in an apartment in the Piazza di S Lorenzo in Lucina. In 1719 he transferred to a house owned by the Borghese family, and he is described in librettos of the period as a virtuoso ‘del principe Borghese’. In 1718 he was admitted to the Arcadian Academy, with the name Ericreo. In 1719 a marriage contract was signed between his daughter and Metastasio (one of whose sonnets is addressed to Gasparini), but for unknown reasons the engagement was soon broken off. Gasparini’s production of new operas continued fairly steadily at Rome and other cities until 1720. After that only a few new ones appeared, the last in 1724. In February 1725 he was named maestro di cappella at S Giovanni in Laterano, but he did not take up the post until June 1786; his assistant was Girolamo Chiti. 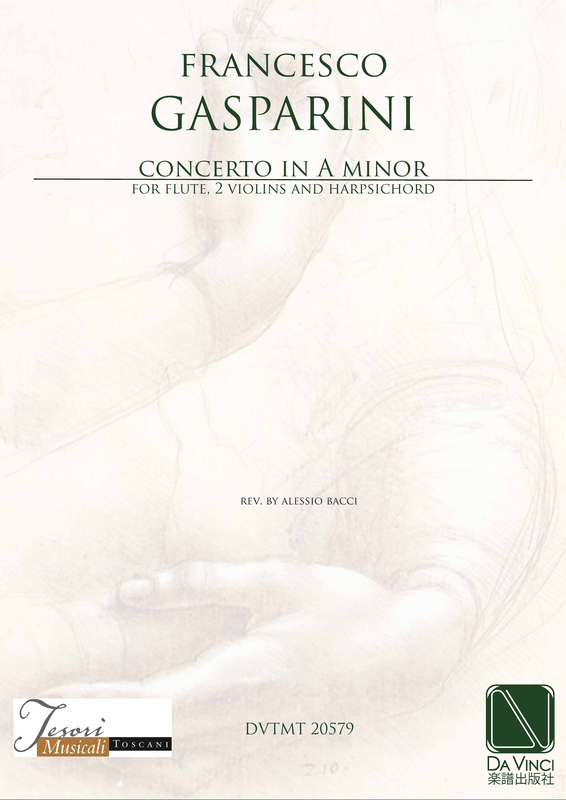 Gasparini at his best was a composer of the first rank. Burney’s description of his cantatas – which are some of the most important of his time – as ‘graceful, elegant, natural, and often pathetic’ can be extended to much of his other music. These qualities rested on a profound technical skill, most obvious in the easy and frequent use of complicated canonic devices in his church music but also apparent from the mastery of free counterpoint in his other works (such as the set of brilliantly written chamber duets, in GB-Lbl). The arias in Gasparini’s earlier operas are typical of the period in using a variety of formal types, but mostly within a da capo format; some arias in the later operas, however, show homophonic textures and melodic and rhythmic traits that make them forerunners of the work of the next generation. His recitatives were praised by Padre Martini; Haas saw him as a model for Handel in his dramatic treatment of accompanied ones. His sacred music includes works both in the strict style and in the modern concerted style with independent instrumental parts. Some of the solo sacred motets are virtually indistinguishable from his secular ones in form (except for the concluding alleluia) and expressive character; but that was typical of the time. Gasparini was highly regarded as a teacher. Besides Domenico Scarlatti his pupils included Quantz, Platti and Benedetto Marcello, who sent him his Estro poetico-armonico for his criticism. L’armonico pratico is a practical manual of figured bass accompaniment for beginners with some musical knowledge. It was used throughout the 18th century, going into numerous editions, the last in 1802, and remains an important source of information about continuo realization at that time. Other theoretical essays by him survive in manuscript. Because of confusion with Gasparo Visconti, called ‘Gasparini’, it was long thought that Francesco Gasparini had visited London in the first decade of the 18th century; two of his operas were performed there in 1711 and 1712. Chamber music published by Quirino Gasparini in the middle of the century has also been wrongly attributed to him.